BELT Drives is now offering billet final drive pulleys in two styles; Mesh and Spoked. Manufactured by BDL in Southern California, each pulley is machined from 6061 billet aluminum and gear cut for enhanced durability and performance. 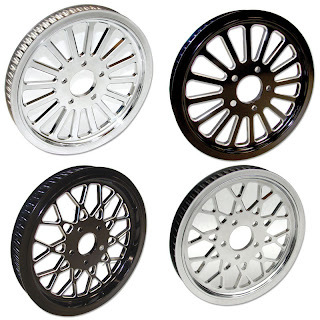 The pulleys are available in a choice of chrome or black with accent cuts and fit H-D models from '00 - '12.